The economic and political future of the United Kingdom hangs in the balance when British voters head to the polls on June 23 to decide whether their country will remain in the European Union (EU). In our view, several risks exist for U.K. stocks and European markets if what is known as “Brexit” wins approval from British voters. While betting odds have consistently favored the “remain” camp, online and telephone polls suggest the British public is fairly evenly split on the referendum vote. However, two recent polls commissioned by The Guardian newspaper of London showed voters favoring leaving the EU by slim majorities. While it is not our central case that the United Kingdom will leave the EU, the probability is higher than we are comfortable with. Increasingly, the immigration crisis in Europe and the terrorist attacks in Brussels in late March are fueling anti-EU sentiment among the British people, particularly older people who typically are more likely to turn out to vote. Supporters of Brexit believe that a U.K. departure will better serve Britain’s national interests on sovereignty, fiscal issues, and immigration, while opponents argue that EU membership affords the country significant benefits, including unfettered access to the world’s largest trading bloc, benefits from labor mobility, and the influence afforded to members of a powerful economic and political club. I believe a withdrawal from the EU would depress economic growth in the United Kingdom in the short term and over time, with widespread negative effects on everything from the value of the pound sterling to demand for London real estate. Many corporations have chosen the United Kingdom as their headquarters for conducting business throughout Europe. As these companies try to work out the implications of a departure, I believe we would see a substantial drop in foreign investment in the United Kingdom. In a post-Brexit world, U.K. exports and imports also would likely be disrupted by the uncertainty around trade agreements. Given the negative effects on employment, overall consumption in the United Kingdom also would likely suffer. For the 28-nation EU, we believe a “leave” vote would be a negative event both economically and politically. 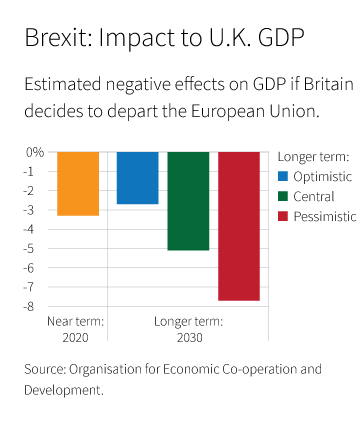 A U.K. departure has the potential to start a broader process of disintegration within the trading bloc — generating further concerns about other countries exiting the EU. For the EU, the loss of Britain — the EU’s second-largest economy — also would potentially weaken the union at a time when it is struggling with various issues, including sluggish economic growth and an ongoing refugee crisis. Meanwhile, the Organization for Economic Cooperation and Development (OECD) has joined the International Monetary Fund, the Bank of England, and even President Barack Obama in warning about the dire economic consequences of Brexit. In a recent report, the OECD said departure from the EU would slash more than 3% from Britain’s gross domestic product by 2020, leaving the nation grappling with constrained financial conditions, diminished confidence, stiffer trade barriers, fewer skilled immigrants, and a lack of labor mobility.